produce the desired voltage in the secondary circuit at high engine speeds. The capacitor discharge (CD) ignition system is also superior to the conventional ignition system. Like the magnetic- pulse transistor ignition system, the CD system has a special ignition coil, a transistorized pulse amplifier, and a magnetic puke distributor. Unlike the magnetic-pulse transistor ignition system, the CD system has a high-voltage condenser connected across the primary windings of the coil. The input to the coil is constant and assures complete saturation of the coil which results in the desired secondary voltage output at high engine speeds. 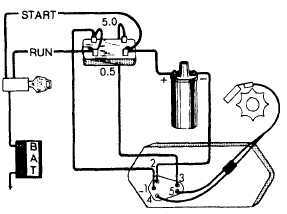 The Chrysler electronic ignition system in figure 4-32 consists of a battery, an ignition switch, a dual ballast resistor, a special ignition coil, an electronic control unit, and a special pulse-sending distributor. 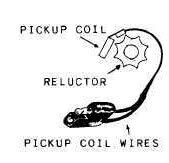 Instead of the cam and rubbing block of the conventional ignition system, the Chrysler electronic system uses a magnetic pickup coil and a rotating reluctor (fig. 4-33). As the teeth of the reluctor pass the magnet of the pickup coil, a voltage pulse is induced in the pickup coil which is a signal for the module to "interrupt" the primary coil current. The magnetic field in the ignition coil collapses and induces a high voltage into The secondary winding which fires the spark plugs. The electronic module is a solid-state device that interrupts the primary coil current when signaled and self-starts the primary current after a predetermined time lapse. A compensating ballast resistor (0.5 ohms typical) is used in series with the ignition coil and battery circuit. The compensating ballast resistor maintains a constant primary current with changes in engine speed. During starting or cranking, the compensating ballast resistor is bypassed, supplying full-battery voltage to the ignition coil. The auxiliary ballast resistor (5.0 ohms typical) limits the current to the electronic module. On this system, you adjust the air gap by aligning one reluctor tooth with the pickup coil tooth. After loosening the holding screw, use a nonmagnetic feeler gauge of the correct size to obtain the proper air gap between the reluctor and the pickup coil. Check the setting for proper clearance at the reluctor tooth with a nonmagnetic feeler gauge that is 0.002 inch larger than the manufacturer's specification. 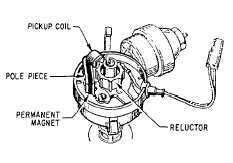 Figure 4-31.-Electronic ignition distributor components. Figure 4-33.-Electronic pickup and reluctor.